A close relative of tofu, tempeh is a fermented soy product that is often used as a meat replacement. 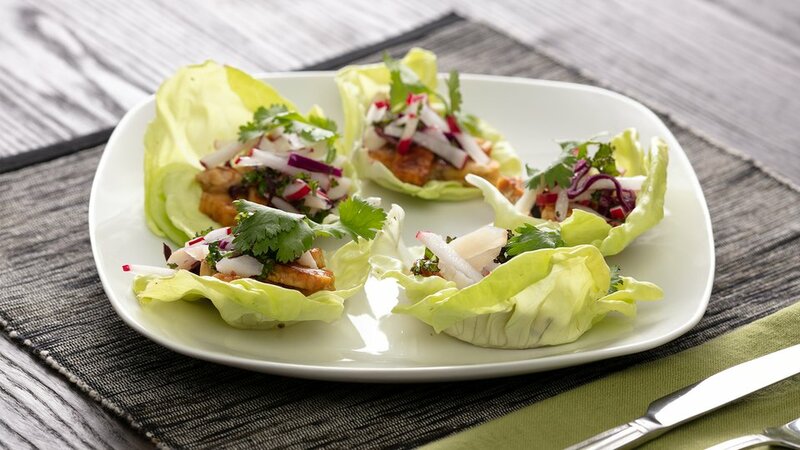 In this recipe, it takes the place of chicken in these fresh lettuce wraps. Radishes and ginger add a zing to this restaurant classic, and water chestnuts add crunch without adding calories. Combine the tempeh with the ginger, soy, and vinegar and let marinate for 30-45 minutes. Mix the cilantro, ginger, and olive oil, and toss with sliced radish, water chestnut, and shallot until coated. Using the butter leaves as cups, fill with the radish mixture and top with tempeh.